The Processions in Sorrento, preceding Easter time, are one of the most important and fascinating event of the year for the town of Sorrento. These Sorrento tradition moments are deeply felt by the inhabitants, which recreate a unique atmosphere with a strong impact,both for the deep religious processions, that for the folklore of which are characterized. In Sorrento the most important processions are two: The White Procession, very suggestive, is held in the middle of the night between Thursday and Friday and represents the output of the Virgin Marylooking for Christ condemned to death on the cross. This event, illuminated by the lights of the torches, takes place with many people, the penitents dressed in white robe and hood that they visit the sepulchresand then back to the church with the first light of the sunset. Different the content of the other most important procession: The Black Procession, more austere and solemn which is held on the evening of Good Friday and that represents the discovery, by the Virgin Mary, of her dead son. The penitents, this time in black robe and hood, carrying a wooden sculpture of the Dead Christ by an unknown author, followed by the Virgin Mary, dressed in deep mourning. 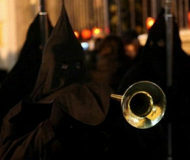 To make the processions even more intense and meaningful there are funeral marches played during the whole procession that can make even most exciting this moments that you will hardly forget.